Bordeaux president Stephane Martin says negotiations with Thierry Henry have ended. 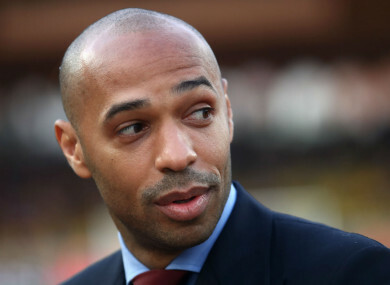 THIERRY HENRY WILL not be the new coach of Bordeaux, the club’s president has told reporters. Poyet left the club after describing Bordeaux’s decision to sell Gaetan Laborde to Montpellier as “a disgrace”. Henry, part of Belgium’s coaching staff at the World Cup, has quit his role as a television pundit to focus on his managerial career. Arsene Wenger, under whom Henry became Arsenal’s record goalscorer, subsequently revealed the former France forward wanted the Bordeaux job. Yes, we confirm the end of negotiations,” Martin told reporters. Reports in France suggested Henry’s wage demands have priced Bordeaux out of appointing the 41-year-old. Email “Henry will not be Bordeaux coach, says club president”. Feedback on “Henry will not be Bordeaux coach, says club president”.